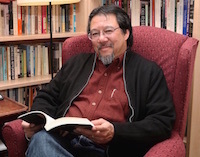 K. Scott Wong is the Charles R. Keller Professor of History at Williams College where he teaches a variety of courses on Asian American history, American immigration history, History and Memory, War and Society, and the Sixties. He has written numerous articles for journals and anthologies and is the author of Americans First: Chinese Americans and the Second World War (Harvard University Press, 2005.) He has also co-edited Claiming America: Constructing Chinese American Identities during the Exclusion Era (Temple University Press, 1998,) Keywords for Asian American Studies (New York University Press, 2015,) and Asian America: A Primary Source Reader (Yale University Press, 2017.) When he is not writing or teaching, he enjoys fly fishing for trout and is still trying to play like Mississippi John Hurt. Asian America: A Primary Source Reader (Yale University Press, 2017) Co-edited by Cathy J. Schlund-Vials, K. Scott Wong, and Jason Oliver Chang. Claiming America: Constructing Chinese American Identities during the Exclusion Era (Philadelphia: Temple University Press,1998). Co-edited with Sucheng Chang and K. Scott Wong. Received the History and Social Sciences Book Award, Association for Asian American Studies, 2001. “The Eagle Seeks a Helpless Quarry: Chinatown, the Police, and the Press. The 1903 Boston Chinatown Raid Revisited,” Amerasia Journal, 22:3 (1996), pp. 81-103. Johns Hopkins University Press, 1998). Gillian R. Bazelon, ’98 – Patterns of Discrimination and Hardship: The Mexican American Farm Worker Experience in Twentieth Century America, 1998.